How I hate this new blogger. I just can't find anything. And since this new blogger came i haven't write a post. And it is about time to write a new post. I couldn't finish my spring challenge because I get sick and it was horrible. Since I ate antibiotics for 14 days, my nails went really bed. I mean bed bed. They chiped and brake all the time. I don't know what else to do, to have my nails back -.-". My polish looks nice on my nails for one day and then my nails chiped and my manicure went bed. Im so sad.. Do you have any advice for me? Well enough moaning...Let me show you todays mani! On my nails: OPI nail envy, BarryM 295-Pure Turquoise, Catrice 270--blue my mind!, OPI RapiDry RopCoat. 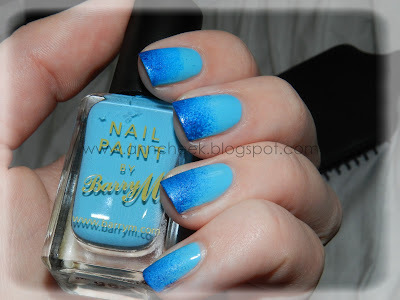 I love this BarryM polish but sadly it is the only one I own. I have to buy some more! What colors are must haves? And expect new post about my favorite products right now really soon! Gold is a new black. Hello my name is Anna and I'm a shopaholic!